The piece at the bottom is the peacocks FMQ sample which features as the background for the linky button below - it is finally finding its way into a quilt! The project in Week 107 that caught my eye was Lee Anna's colourful summer quilt. Such a cheerful riot of colour and beautiful stitching! If you haven't seen her blog post yet, nip over now and see more photos. If ever I had a lucky photo, it is this one. It was taken on our last morning in Kerry, before driving back to County Wicklow. The wind was blowing so hard that I am amazed I kept the camera still, and having the horizon level with the high tide line is pure fluke. Still working on attaching the sample pieces, using my favourite Quilt As You Go method. I am testing a slight change in the method, but need to attach a few more pieces before I can be sure it is consistently better. This latest piece I have joined has got a few artistic tucks. Not ideal, but I'm not going to fret over them. Sewing has had to take a slide down my list of priorities over the summer, but I am hoping to get back into the groove over the next month or so. 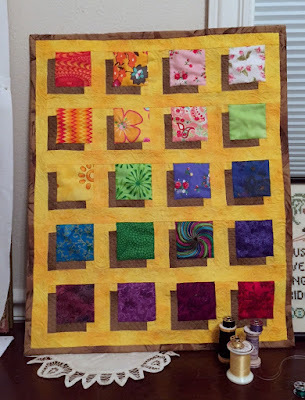 The project in Week 106 that caught my eye was Janice's shadow block mini quilt - full of loads of things that went wrong and even more that went right. If you haven't seen her blog post yet, nip over now and see more photos. Rearing up in front of the lake at Powerscourt in County Wicklow. Unusually restrained colours - I don't usually go for neutrals, but when I laid out all my practice pieces out together last week I rather liked the effect, and now I have joined the first two pieces, I think this project might start growing on me. The dinky pale brown check blends in really well. It's a shame that I haven't got enough for the binding. Or have I? I shall find out soon enough. The project in Week 105 that caught my eye was Olena's amazing magnolias. 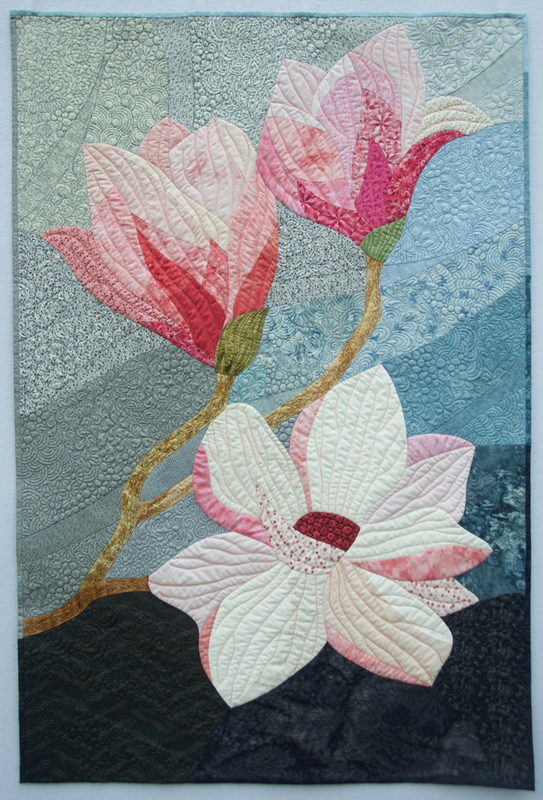 The colours are beautiful, and the quilting adds so much interest in the background. If you haven't seen her blog post yet, nip over now and see more photos. One of my favourite views within a minute's walk of our house, and one of the reasons that most of my stitched landscapes have a church tower somewhere in the distance. Putting labels on panels - that's the sum total of my work quilting projects this week. Not much, but an important step nonetheless. These pieces have been stuffed in a bag in the sewing room for far too long. It is time they were made into something, and it's not going to be anything special, perhaps just for slobbing around on the settee. The project in Week 104 that caught my eye was JanineMarie's wedding gift quilt - absolutely gorgeous! If you haven't seen her blog post yet, nip over now and see more photos. So, fourteen darts in the dress and the same number in the lining. Twenty eight! I didn't realise I was such a sucker for punishment. Because it is important to get darts straight and exactly right size so each pair are an exact match, I am making tracings on tissue paper and using them as guides. The first picture shows the pattern piece for the back of the skirt. There is a central back seam, so I have cut two mirror image pieces for the garment. To the left of the picture is the guide I have traced, with the central fold line of the dart on the left and the stitching line on the right. Because I am making four of these darts in total, two on the dress and two on the lining, I have pinned three more strips of tissue underneath the top one so I can make all four guides at once. Next, with no cotton in the machine and the longest stitch setting, I stitch along the stitching line to make a perforated line. It is important not to separate the four strips from each other at this stage, and the perforations help to bond the strips together. Then the guide has to have a clean straight edge cut along the dart fold line for the whole length of the paper strips. Here is the top strip laid over the dart on the pattern to show how well it duplicates the shape. The three guides underneath have no pencil lines, just the perforated line. When using the guides, this perforated line is all I need, but the dots could be highlighted by a pencil line drawn over them if necessary. To mark the end of the dart on the actual skirt, I put a pin through the material and then iron the fold to the top. The paper guide can then be pinned on, with cut edge flush with the ironed fold and the tapered point is lined up with the pin. Now I can sew over the paper along the perforated line. ... and now with the paper removed. It is surprising how strong the paper is and if pulled against the stitching it can actually tug at the thread. To prevent this I hold the paper and fabric on either side of the stitching and gently stretch the fabric. The fabric has a certain amount of give and the paper hasn't, so it tears and comes away at the stitching. When it comes to sewing the dart on the other side of the skirt, I can be sure that I will have two nicely matching darts. Here they are, laid side by side. ...pull them slightly and snip them and lose them inside. This way I can be sure that the stitching will not come undone and I have a neat finish. Finally, a close up of the dart that ended up in the middle of a pineapple - no nasty bubble, and no juice running either. Dull skies over the Sugar Loaf seen from the gardens at Powerscourt, just a few miles from where my son is now living in County Wicklow. Nice and cheerful for a summer dress, which probably won't be worn until next year. It is a cotton poplin, chosen by my daughter, who has a weakness for tropical designs. She wants a fitted, straight-skirted dress. Easier said than done, especially when she tells me "I want a zip." If she knew how much psychological damage those four words have caused me, especially when thinking up a dress with lining. I am a zipphobic and have decided to conquer the many-toothed demon. Work so far has consisted of making a rough cut dress from an old duvet cover to get the size and position of the darts, then making a toile from calico to get a good fit. I only stuck pins in my daughter twice. No blood. She accused me of direct voodoo, with no doll. Then I unpicked the toile, ironed the pieces and laid them on tissue paper to draw the paper pattern. The whole process has taken days, but the aim is to have a perfectly fitting dress for her so I can make another when she isn't here. Had I used a commercial pattern I would have had to spend an age making adjustments, so I decided to draft my own. Will I have the dress made before she goes back to university for the autumn term? Probably not. This little pile is of practice pieces that I made between three and four years ago. My plan is that by this time next week I will have made a decision as to how to put them together for a small quilt. In other words, it has been a nil quilting week. All the action has been on the dressmaking front, but that's another story. The project in Week 103 that caught my eye was Sue's big bold flower in black, white and yellow. If you haven't seen her blog post yet, nip over now and see more photos.